Aishwarya Rai is one gorgeous woman but she doesnt experiment much with her outfits except when she is out walking the Red carpet at French riveria. The 70th edition of Cannes Film Festival is on and I am so excited to see Indian beauties take the world by Storm. So far it has been an amazing run for India with Deepika Padukone, Shruti Hasan, Mallika Sherawat and Aishwarya Rai all coming looking gorgeous in their own ways. 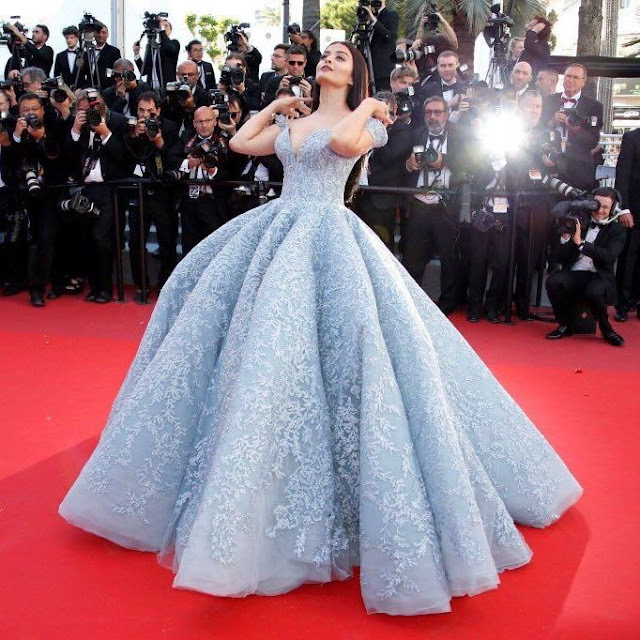 In this post I will be Talking about all the mesmerizing looks of Aishwarya Rai at cannes 2017 in particular. Lets begin with her dramatic, jaw dropping Michael Cinco powder blue gown which she wore for okja screening. The voluminous gown was balanced with sleek hair, soft makeup and Aishwarya Rai sure looked stunning. The confidence, Poise and grace with which she carried of herself on the red carpet truly makes you believe she is the queen of Cannes. I cant help but get thee cindrella meets Elsa frozen vibes from this look but I would definitely change that lip colour for added impact. This gown may go down as one of the best fashion moments of Aishwarya at cannes. For her second red carpet appearance Aishwarya chose a red ruffled Ralph Russo gown which she paired with open wavy hair and bold lip. Wearing red on red carpet could be very tricky but Aishwarya Rai pulled it of like only she can. The dangling pair of earrings, sweetheart neckline and the trail of gown made this look even more fabulous and I just cant stop staring. I remember Katrina Kaif did a red gown on red carpet at cannes and failed miserably at it. This is just amaze-balls. Earlier aishwarya worked a semi sheer Yanina creation which was bottle green with huge floral details. the multi layered gown is not my cup of tea and i cant seem to like it but full points to Aishwarya for looking great in it. The makeup in this look was perfect. Looking exquisite was Aishwarya Rai in another disney inspired beige embroidered gown with red lips and gold shoes. Love this look but I feel she should have gone for a different hairstyle. Her open middle parted hair is getting boring and makes her look almost same in every outfit. For a photo shoot at Cannes Aishwarya wore a black ruffled Ashi Studio gown which featured a high slit. This look was completed with a coral lip, blue eye makeup and open hair (again!). I was abit disappointed with this look because the gown did not photograph well and the makeup also was a mess. The coral lip looked very garish on Aishwarya, the blue eyes was just not needed and the chunky footwear added to list of problems. 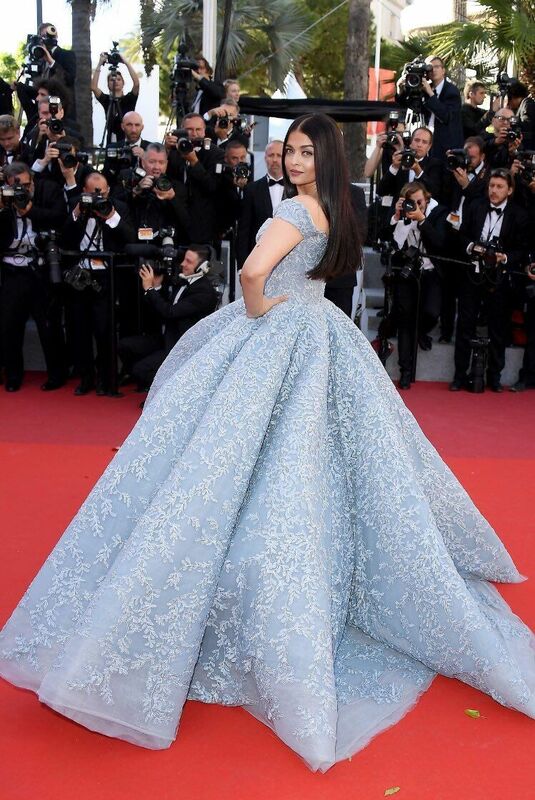 I maybe criticizing abit too much, but can you blame when Aishwarya herself raised my expectations with the princessy breathtaking blue gown? Did Aishwarya Rai wow you too with her dramatic run at Cannes 2017 ? Are you excited to see what Sonam Kapoor bring to Cannes red carpet? I sure Am!